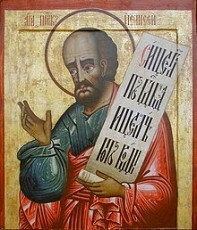 Elisha is not well know in the Roman Catholic Church today, but is widely celebrated in the Eastern Catholic Church. The celebrations of his fest began within the Carmelite Order in 1399. He is generally depicted with the scroll of his prophecies and in various episodes of his life. Holding his prophecies is among the most known artwork that exists today, and the relics of the prophet Elisha are claimed to be among the possessions of the Coptic Orthodox Monastery of St. Macarius the Great in Scetes, Egypt. Elisha was a prophet of the Northern Kingdom of Israel. He was a rich landowner, and was plowing a field with twelve yoke of oxen when the prophet Elijah threw his mantle over him, and asked him to follow him. He obeyed, and became a disciple of Elijah and continued his work. He was not known as a writing prophet, but rather one of a miracle worker, and many of his miracles are related in the Bible. His history for those that want to learn more about St. Elisha is narrated in the two books of Kings. Best known for becoming the attendant and disciple of Elijah (1 Kings 19:16-19) he witnessed Elijah being taken up in a whirlwind, he was accepted as the leader of the sons of prophets, and became noted in Israel. By his own admission, he possessed a “double portion” of Elijah’s spirit, and for sixty years held the office of “prophet in Israel”. As Elisha’s desire was to “Make known the Divine Will of God” to the people of their times, we can benefit from that today. So many times in our lives we ask the simple question, “What is God’s Will for me”? By asking for the intercession of St. Elisha, we can obtain the Grace to know more of the Divine Will God has for us, in our lives. Only by living in union with God, can we know in our hearts, we are doing what HE created us for. By asking St. Elisha to help us to discern that, God’s Will can be made more clear to us.